Passing along some great deals I have found. Make sure you read all the way to the bottom for a some great FREE stuff. TODAY only 7/2 Unit Studies Patriotic Holidays $4 and Independence Day $3. Great deals on A Journey Through Learning going on right now! -All Apologia lapbook downloads are on sale for $8. Currclick FreeBEES and SALES! Find the Olympic torches for 12 FreeBEES plus get lots of discounts on some great products. Knowledge Box Central Lapbooks check out these awesome $5 lapbooks. Sign up for the newsletter and receive a $5 coupon to receive a FREE lapbook. There are lapbooks for virtually everything like American Girl, Apologia, Seasons, States and more. GA Deal - $7.50 for One Open Studio Session at Cool Bees Artwork & Gifts in Alpharetta. PowerCapes Custom Kids' Costumes $40 value toward any purchase for ONLY $20! These are adorable and the perfect gift for a girl or boy. 4th of July Printables from Education.com. For my blogging friends. 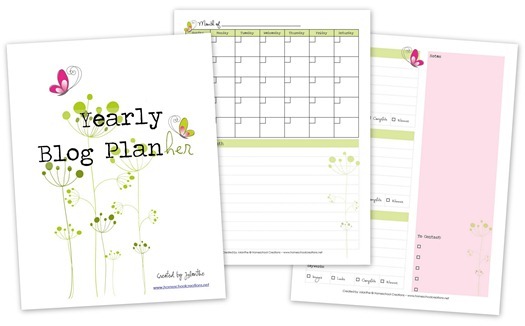 Homeschool Creations has a FREE Blog Planner. I am seriously considering using this for myself it looks great. FREE year in review printable. Great for a keepsake and possible State record keeping depending on your State requirements.